As outsourcing increases, manufacturers are ever more dependent on their suppliers to ensure customer success. While this has helped companies reduce cost, it has come at an increased supplier risk and lack of visibility into supplier processes. 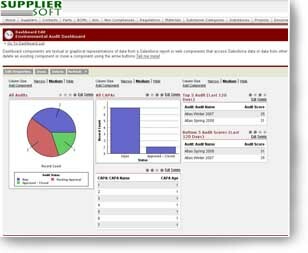 To compensate for lack of visibility, companies have increasingly resorted to supplier audits as a way of gaining insight into supplier processes and reducing supplier compliance risk. Quality audits are frequently used to ensure that supplier have processes in place to deliver quality products. In addition, as regulatory and market pressures related to environmental compliance and Social and Ethical Responsibility (SER) rise, companies are increasingly doing environmental and SER supplier audits. Lack of central visibility into audit information: Since audit information is usually captured in spreadsheet/word and e-mail documents, it is difficult to have central visibility into current and past audit information across key internal stake holders, supplier and third party auditors. Lack of analysis capabilities: While audit reports can be complied for an individual audit using spread sheet capabilities, comparing information across multiple spreadsheets is difficult. As a result, it is hard to get trend reports across multiple audits on a supplier and to compare suppliers with each other. Inability to integrate third-party auditors: When third party auditors are used in low cost regions, it is difficult to get visibility into the audit processes and collaborate with auditors. Inability to enforce audit processes: As multiple functional within a company work with multiple roles at supplier location and third party auditors, defining and enforcing audit processes becomes difficult. Difficulty following up on corrective actions: When audit deficiencies are identified, manual process make it difficult to have closed loop corrective actions – not only must the issues fixed, but they must be monitored to ensure that they don’t surface again. As a result, companies face increased supplier risks, brand name risks and risk of non-compliance.